While USD was losing power, there were not many economic reports in the UK to support GBP; however, The NFP data and employment data might support USD. 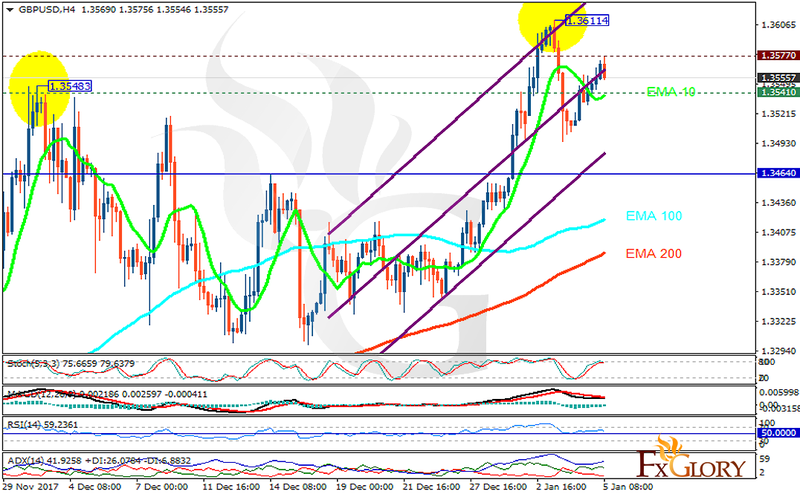 The support rests at 1.35410 with resistance at 1.35770 which both lines are above the weekly pivot point at 1.34640. The EMA of 10 is moving with bullish bias in the ascendant channel and it is above the EMA of 200 and the EMA of 100. The RSI is falling towards the 50 level, the Stochastic is moving in high ranges and MACD line is below the signal line in the negative territory. The ADX is showing buy signals. The indicators are showing mixed signals; the price will be consolidating within the 1.35 and 1.36 areas; however, if USD is supported, the pair will drop to 1.33.